Amazon indigenous women leaders have told Ecuador's president Lenin Moreno to limit oil drilling and mining in their territories and combat the sexual violence and death threats they claim accompany the industries. The delegation of women dressed in traditional tunics and with intricately painted faces were granted a meeting with Moreno after nearly 100 of them camped in Quito's central plaza in front of the Carondelet government palace for five days earlier this month. "We gave him our demands, which was what we intended to do. We will return to our communities and wait for a response from the government. If we do not receive a response within two weeks, we will be back," said Zoila Castillo, vice president of Ecuador's principal Amazon indigenous federation CONFENIAE. In the first presidential meeting granted to the women's movement, Moreno assured them he would heed their demands and try to find consensus but added, "it's almost impossible for a world to exist without oil and mining." In December, Moreno agreed to a moratorium on new auctions of oil and mining concessions without the prior and informed consent of local communities, following a two-week march by hundreds of indigenous people from the Amazon to Quito. But in February, his government announced a new oil auction and handed out several new mining concessions. Moreno was praised by environmentalists last year after promising the United Nations he would do more to protect the Amazon. "Your government cannot permit that our rights continue to be violated," Patricia Gualinga, an indigenous Kichwa from Sarayaku, told the president during the meeting. "Ecuador has to change its energy policy. It could be an example for the world," she said. Gualinga, who received death threats in January, said environmental defenders, particularly women, were increasingly at risk in Ecuador. "The threats against women are a consequence of extractivism," Nina Gualinga, a 24-year-old activist from the same community, told the Guardian. "Women don't want more oil and mining exploitation. It is women who care for the children, who care for the land so it should be women making these decisions." Ecuadorians voted overwhelmingly in favor of rolling back mining in urban and protected areas and curbing oil drilling in the biodiverse Yasuní national park in a February referendum. 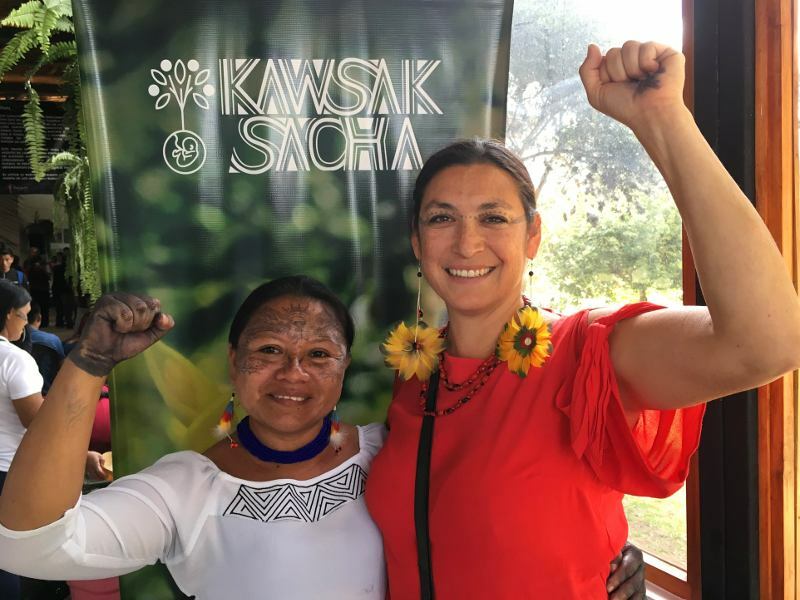 "After two months of planning and two weeks of mobilizations, the voices and demands of Amazonian women defenders of the Amazon against extraction were finally heard," said Leila Salazar-López, Executive Director of the NGO Amazon Watch.